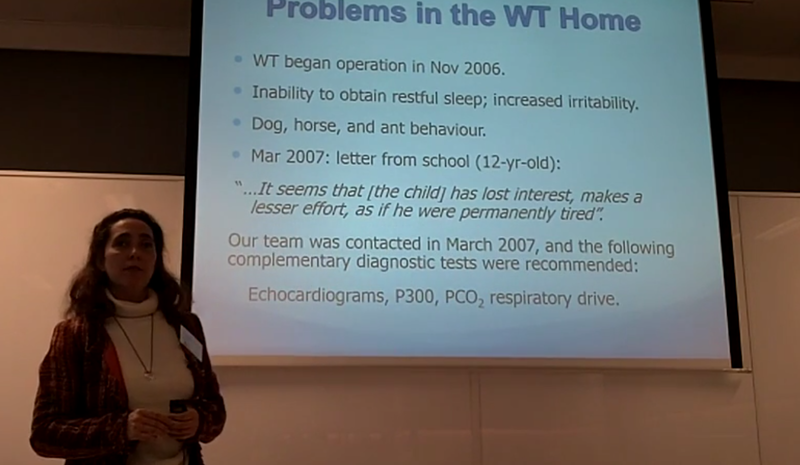 Dr Maria Alves-Pereira: explains why turbine generated low-frequency noise is so annoying inside homes. Dr Mariana Alves-Pereira of the Lusofona University in Portugal, has degrees in physics, biomedical engineering and a PhD in environmental science. Her team has been researching vibroacoustic disease since 1980 – initially focussed on the low frequency noise (LFN) that impacted aeronautical technicians. 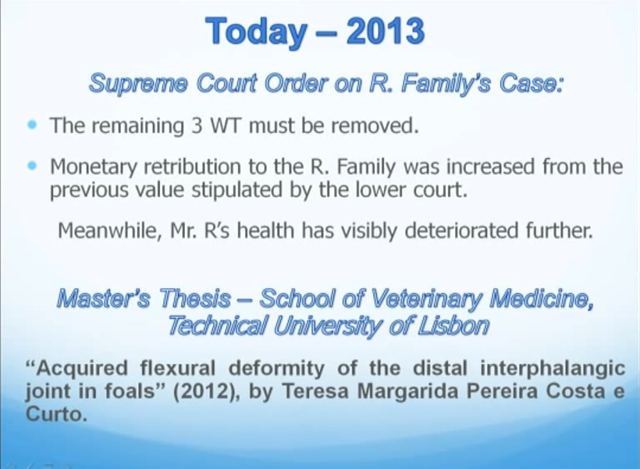 In the balance of the post we’ve set out the transcript of Dr Alves-Pereira’s presentation and the slides she relied on (for the full presentation – see the original here). Hello everybody. Thank you for having me here today. My group has been studying low frequency noise for 30 years. Initially we began with people working in low frequency noise (environments). 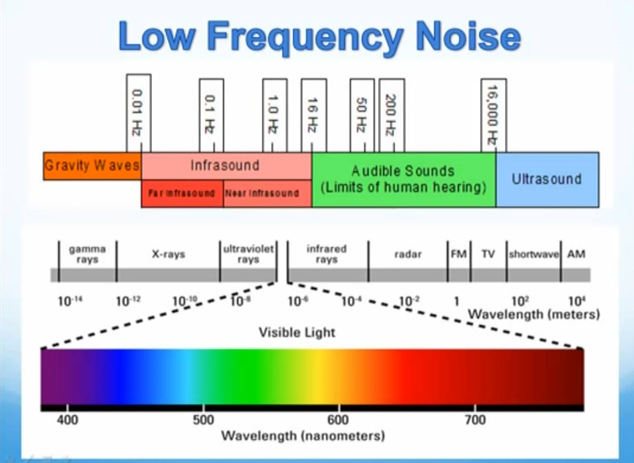 Low frequency noise is a little bit like light. You know that there are x-rays that you do not see, but it is light. You know that there is ultra violet that is bad for your skin and you do not see it. If you use dark glasses for x-rays or ultra-violet, it will not protect you. This is similar to noise. Over the years, we, the scientific community have decided that noise only affects your ears. That is why we have the dB(A) unit to measure noise. Because we are interested in only measuring the noise that will causing hearing damage. Low frequency noise does not cause hearing damage. It will not make you deaf. It is not measured when you use a dB(A) unit. Compare the light with the noise. On top you have noise on bottom have light. Look what we do with the light. We separate UV, infra-red, x-ray. We do not do this with acoustics. So how do I know which part is affecting your heart? Or you lungs? Its all in one big bag. This is the problem with measuring the agent of disease. On top you see what is a noise wave. I am here and the noise that is coming is going to hit my body. What you see on the right is your cells. So when the cell gets the impact of the wave, it will move. Like you see underneath. around this house in 2006. This is what it looks like. I am a scientist, I can not put up information about the noise that was measured without giving you the technical specifications of how it was measured. So, the red is the noise in the house without wind turbines working. The black and the grey is with the wind turbines working day and night, night and day. This is measured inside the bedroom – not outside. Do you sleep outside? So if anyone comes to measure the noise because of the wind turbines, and they do not go into your house, you will laugh – yes? 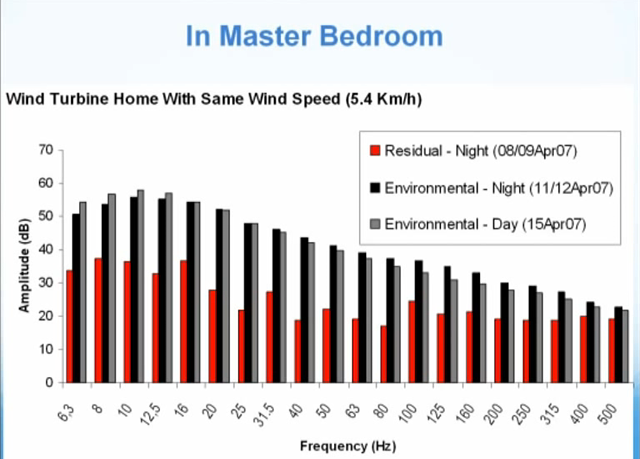 So as you can see at least in this house, these wind turbines were responsible for a great increase in the low frequency noise in the bedroom. So what happened to this family? The wind turbines began operation in November 2006. Immediately the family recognised that they were waking up tired. The dogs that used to be jumping and always wanting attention were now sleeping. you had to step over them. The horses were lying down in their stable. And ants disappeared. 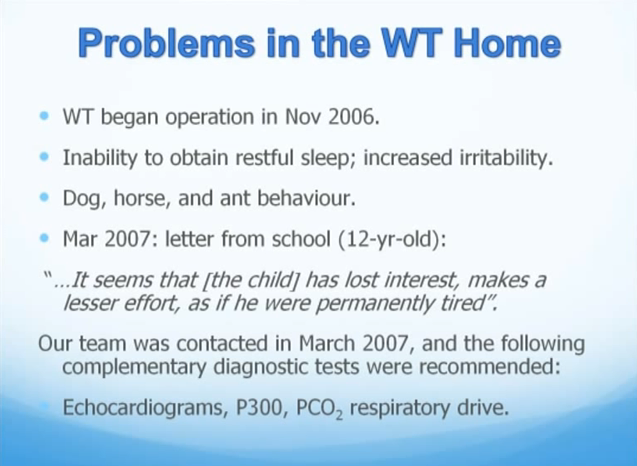 In March 2007 the parents received a letter from the teacher of the boy, of the son, asking why this child was so tired now. He was losing all interest in school, he had no energy for physical education and a very good student was suddenly going down, down, down. find out how the people’s health was developing. It is not through questionnaires. No questionnaires. If you have people with cancer, would you accept a doctor who would attempt to cure the cancer with a questionnaire? Tell me what disease is evaluated just with questionnaires? We gave this family the tests, the medical (not subjective) medical tests, that we would give to the workers in low frequency noise. What you are seeing now is the development of symptoms and signs related to the disease developed by exposure to low frequency noise. 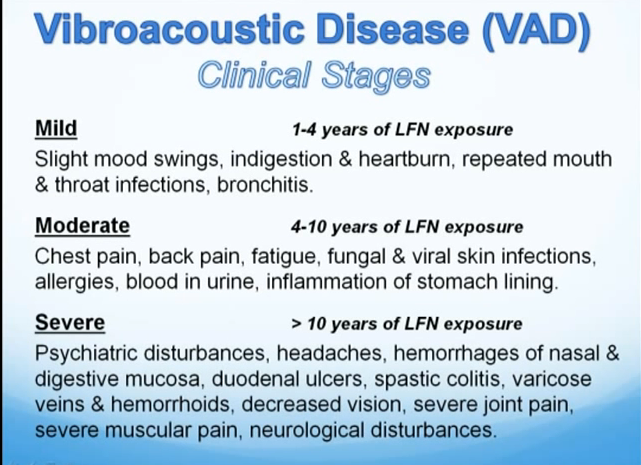 Signs and symptoms associated with the disease that you develop if you are in low frequency noise. As you see, it is over years that it develops. If you have low frequency noise in your home on day 1, day 2 its okay, day 3, day 4 – in a year! In 6 months, a year, 2 years, then it’s a problem. Then you realise. Then it is 6 months that you are tired and can not sleep, not a wink. This is the test that we give to people to see if they have problems with low frequency noise disease. On the right the test measures the time your brain takes to respond to a stimulus. Normal is 300 milliseconds. 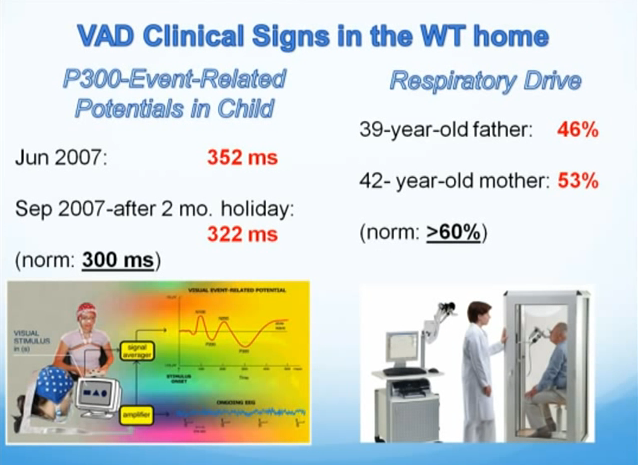 In the 12 year old child in the wind turbine house, he was having in June 2007 352 millisecond – this is a huge difference. When the child left the house for vacation, in September after being away from the house for 2 months the measurement came closer to normal. On this side we have a breathing test. This breathing test measures how well your brain is controlling your breathing. Usually, if you have lesions in the brain, you will have problem in the breathing – and this is what this machine measures – not questionnaires. So normal for that examination is above 60% and as you see the husband and the wife were already showing lower values. The child was not tested. What is happening with the legal? This man, this family put the wind turbine developer in court. 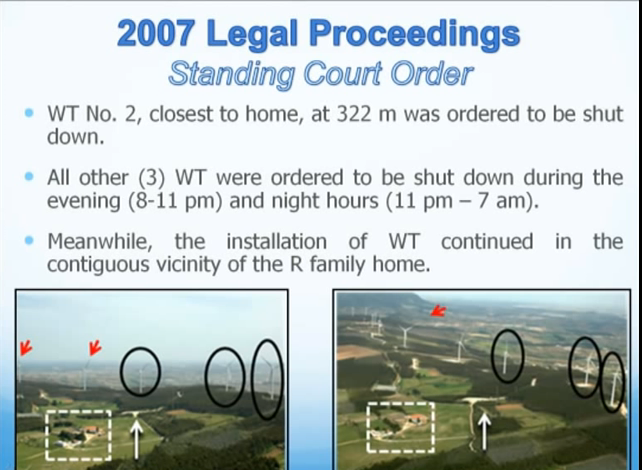 In 2007 as a precautionary measure, the court said, take out wind turbine 2 – as you can see the white arrow, there used to be a wind turbine there. The court said that one has to go. And the other 3 must be turned off at night. 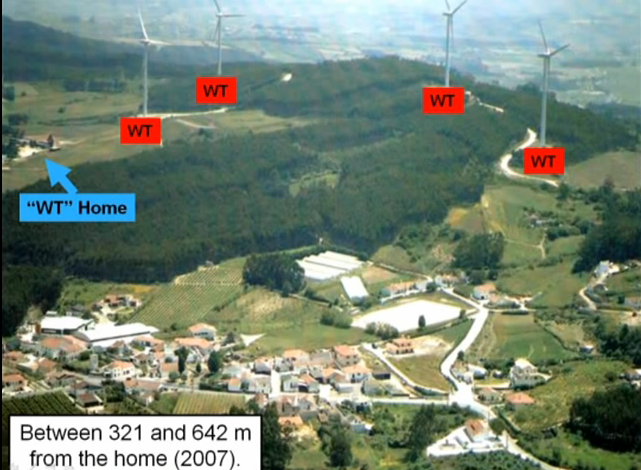 And while this court case was ongoing, the developer continued putting wind turbines all along (red arrows). Today, the Supreme court of Portugal decided that all 4 wind turbines must be removed. Of course it is only those 4 because the other ones were not covered by this case. The wife and children no longer live in this house since 2007. Only the father is in the house to take care of their horses. Today his health has visibly deteriorated. 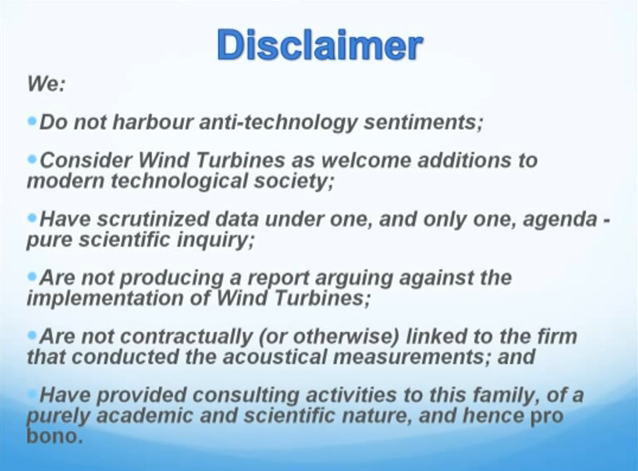 This is basically my information to you about what we know about wind turbines. 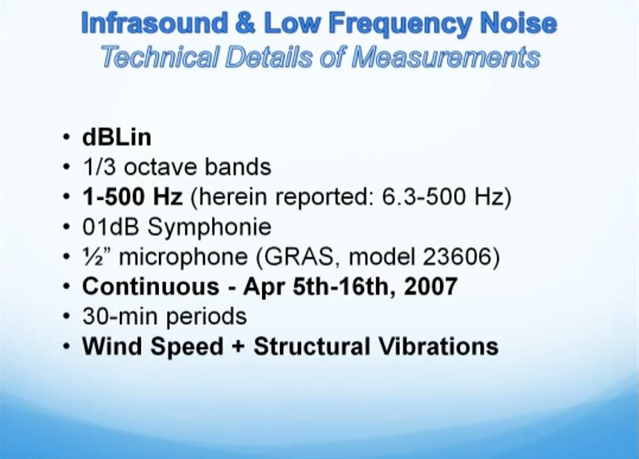 Of course, 30 years of research into low frequency noise – you can not speak in 10 minutes – all the information. (Email m.alvespereira@gmail.com). Dr Mariana Alves-Pereira…. a pioneer in understanding the effects of industrial Wind Turbines!!! We are surrounded on two sides by wind turbines. The closest is 1610′ away. We can see 126 turbines, 1.7 MW, about 450′ tall with over 160 foot-long blades (no one seems to know, most calculations support that they are about 180′ long). They began turning September 18th of 2015, it is now February 16th of 2017, coming up on one and a half years. I believe we are showing symptoms in the >10 year spectrum. If I sleep up in view of the turbines or in the house I lose significant periods of time (I’ve been told I may be having small seizures – I don’t fall, I simply lose an hour or so here and there), so I have to sleep on the property in a hole, which causes the march of time (for me) to progress normally. This time loss is new, since about November of 2016, however, I discovered in 2015 that sleeping in that hole caused an improvement in my health and attitude. This is no way to live, hiding from the blades of turbines that don’t even produce viable power and need a gas turbine or other conventional power to produce the electricity they are purported to produce. Worse, every time I leave the hole I can feel the entry into the poisonous environment the turbines produce, and it does not feel good for my body. Anyone who says I am wrong about this is lying or should not be speaking. Yes, that last statement is a challenge – come live on this property for a year and a half. You are allowed a month of vacation, spend it wisely. You also are required to drive up into the heart of the turbine array when the blades are turning at least approximately once every ten days and spend at least half an hour driving through the array – try to remember as the year and a half progresses that you believe there is no problem or that the problem is exaggerated. Bonjour et merci pour cette superbe étude Dr Alves Pereira. Je suis inquiet pour les habitants de notre très beau Pays, le Portugal et plus précisément pour la région centre ou il y a beaucoup trop d’éoliennes. En France, il n’y a pas d’étude de cette qualité, c’est votre étude que je vais citer en référence pour lutter contre un futur projet près de chez moi, encore merci ! Research by Dr Neil Kelley presented to the windpower ’87 conference in San Francisco in Oct. 1987 also proved that wind turbine noise can damage people’s health. On the basis of this research big fan manufacturers changed the fan configuration from downwind (blades downwind from the tower) to upwind (blades upwind from the tower). Yet the windustry weasels still claim there is no evidence. I believe their words as much as I believe the verbal diarrhoea forth from the mouth of a politician. Do know how to tell if a politician is telling lies? … their lips move! same goes for the windustry weasels. The wind weasels, our governments and so called professors of Public Health can all lie to the masses, they can all deny that wind turbine syndrome exists, they can all try and bury affected people like us but this is not like mobile phone towers. This is real and measurable. Mister professor, this one is not going away. When you lose your status, you can always try and live off your ego. That is all you will have left. Gotcha! And they say there is no credible research! Whether it’s research relating Low Frequency noise and its effects on aeronautical technicians, or effects from Low Frequency noise from industrial Wind turbines on farmers, it’s still a matter of cause and effect. The industry and testing by acousticians and even the SA EPA, have shown low frequency noise is present. At one time the industry and its supporters said there was no such thing as Low Frequency noise, slowly and reluctantly they have come to accept they cannot continue to say it, and are gradually and even more reluctantly having to admit their instruments of torture produce it. Dr Alves-Pereira’s work has been known of for years by those with an interest in the subject of Low Frequency noise and IWT’s, but the industry and its supporters have taken no heed, perhaps it’s time they did and stopped this evasion and faced up to the truth of their ‘precious’ industry. What a find! Congratulations all round. We have had to reinstate this post – apologies for the delay. If a post of yours ever disappears – remember that you can always use the Wayback machine – internet archive http://archive.org/web/ to find it and repost – this is the second time it has saved us when a post has disappeared!